Equipped as a coupé with the spectacular wings and the widened front and rear body of the Porsche 911 Turbo, the Carrera 3.2 Turbo-Look first appeared in the official sales price lists of Porsche AG in model year 1984. Parts of the chassis of the fastest production car of its time, as well as its brake system were supplied as standard in the Carrera 3.2 Turbo-Look and were officially installed in a Porsche model with naturally aspirated engine for the first time. The customer had to dig deep into his pockets for this technical upgrade and the spectacular performance. The surcharge for the I491 option in model year 1984 was an impressive 24,900 DM. 25,950 DM a year later. 1986 - 27.950 DM, 1987 and 1988 - 29.350 DM, and in his last model year 1989 - 29.790 DM! 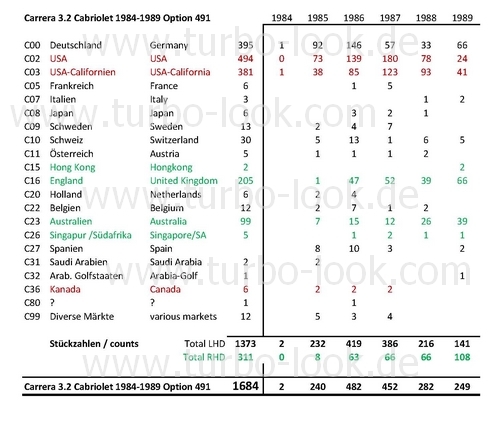 For the USA there is only one convertible from the model year 1984 with I491, others, in whose internal cardex the option 491 is not listed, but which carry all the insignia of the original Turbo-Look, are documented in the register (marked as "not verified"). The same applies to the RoW (Rest of the World) vehicles of this model year. 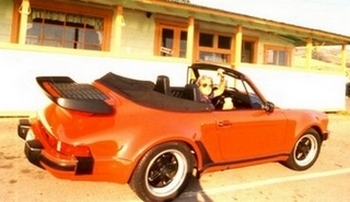 From the MJ 1985 the Targa and the Cabriolet in Turbo-Look (I491) could also be ordered officially. All model variants were manufactured on the production line alongside the regular models until the production of the so-called "G-model" was discontinued. If the customer wanted to do without the striking wings, Porsche used GRP aprons instead of the one-piece rubber spoiler in the front area on the right and left, which integrated the fog lights and which were integrated into the fenders and the bellows. 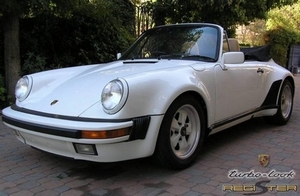 The same construction was later used for the 1989 Speedster. Contrary to the official spelling, according to which a front spoiler alone without rear spoiler was never installed ex works, it turned out that the Swiss vehicles with M470 (no front and rear spoiler) were nevertheless delivered ex works with a front spoiler! 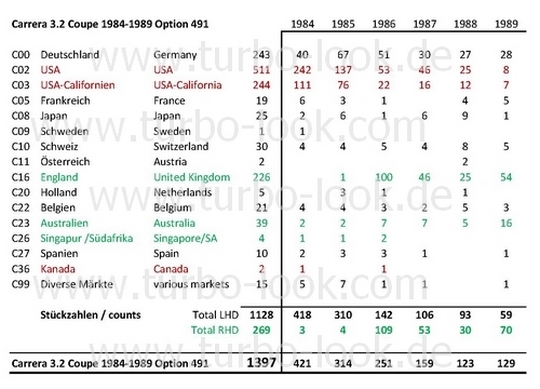 All quantities of the rare factory Turbo-Look models are determined binding! 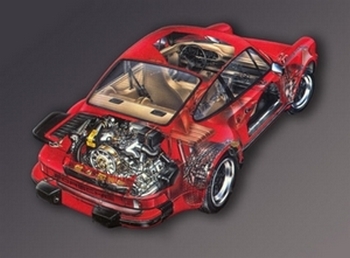 The wheel suspensions of the Turbo, derived from the 3.0 RSR, were also used in the WTL (Works Turbo-Look) models. Caster and negative camber were increased and a connecting pipe made of cast aluminium was installed. The track width increased at the front by 60 mm (with 7J wide rims). Weld-in parts increased the stiffness of convertibles and targa. The one-piece, 20 mm thick version was initially chosen as the stabilizer, but was replaced by a 22 mm thick stabilizer as early as 1985. The rear trailing arms were modified, made of aluminium sand casting, and a track widening of 120 mm (with 8J wide rims) was created. The rear stabilizer had a thickness of 20 mm. In the last year of construction it was then reduced to 18 mm. At the front and rear, the Boge shock absorbers of the normal production vehicle ensured perfect road holding. The Bilstein gas shock absorbers of the Turbo were dispensed with, as well as its tie rods. 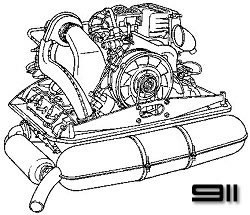 It is written again and again that the WTL has the chassis of the turbo - this is only conditionally correct. 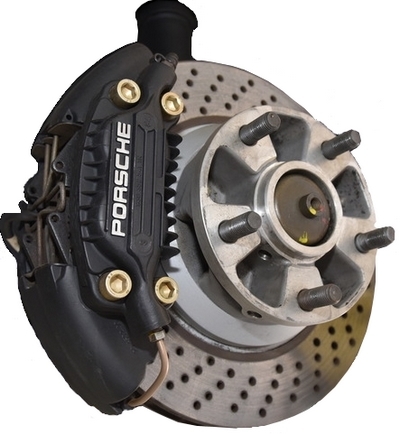 The brake system, derived from the 917 System, was the most effective brake of its time and is still beyond any doubt. In the front 304 mm large, 32 mm thick brake discs are installed. At the back they have a diameter of 309 mm and are 28 mm thick. Mounted on aluminium hubs and equipped with heavily ribbed 4-piston brake calipers, they have an enormous deceleration potential. The scope of equipment varies greatly depending on the target market. Early WTL were supposed to come on 7J + 8J x 15 large forged Fuchs alloy wheels. 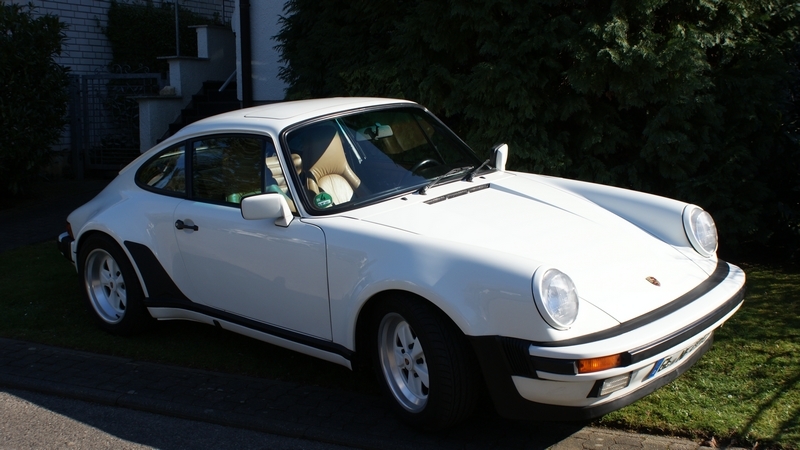 - from model year 1986 on Porsche provided the 7J + 9J x 16 large wheels for the factory Turbo-Look and Turbo, fitted with 205/55 VR 16 and 245/45 VR 16 tyres. The equipment variants are as different as those of all other Porsche models. As you know, nothing was impossible at Porsche long before Toyota claimed this saying for itself. It should be noted that most of the WTL have been well equipped and individualised in the exclusive department. The customers usually didn't care about a little extra price.